This 2 piece bench set will add a classic spanish style to any patio or garden. The set includes the Woodard Casa cast aluminum bench and end table that can be custom ordered in any of Woodard's current frame colors. 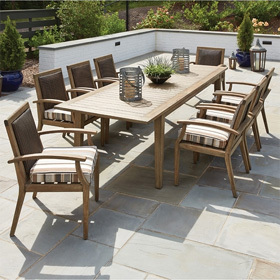 This Woodard furniture set uses only the highest grade and most resilient aluminum, insuring years of rust free use. Bench 44.5"W x 25.5"D x 36.75"H 45 lbs. End Table 22"W x 22"H 15 lbs.